Pours a nice copper color with reddish amber hues. The head is off white and quite soapy. The head also diminished very quickly but has left a nice ring around the sides of the class. This beer also has nice carbonation, lots of tiny little bubbles rising up from the bottom of the glass. The nose is hops and spices more spice then anything. I really can’t pick up anything else on the nose mostly pumpkin spices cinnamon mostly and some hops. Well that’s a lot of spice. Not terribly over spiced but more then Harvest Moon or Post Road. There is also something else, something I can’t quite grasp in the finish of this beer. Let me try this again. So you start with a slight sweetness but not your typical malt sweetness more of a pumpkin sweetness, then a nice carbonation over the tongue but then there is that finish that I’m having a hard time describing. Spicy for sure maybe some hops but there is something else I can’t quite put my finger on. I think it may actually be from real pumpkin but it is bordering on the unpleasant. As this beer warms and opens up it gets easier to drink well at least you get more accustomed to the spiciness but it doesn’t get any better. Sorry this is probably the worse review I have ever done. This was not a bad beer I’m just having a hard time describing the finish. Well overall it’s a drinkable Pumpkin Ale, not the best and certainly not the worst. 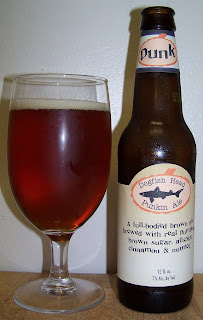 I really did expect something better from Dogfish Head. It was spicy up front but a very odd finish that just was not very good. So far this is my least liked Pumpkin Ale I’ve had this season. It’s early yet so I’m sure I’ll have worse ones then this. I would take Post Road, Harvest Moon and this one in that order so far this year. So I can’t say that I would recommend this Pumpkin Ale. It’s not bad I just didn’t think it was very good. Spicy for sure but lacking something. I don’t know enough yet to tell you want it’s lacking but there is something odd about it. Maybe next year Dogfish Head.